Missiles that shoot from the tip of its fingers! Missiles that shoot from the tip of its toes! Missiles that shoot from its knees! More missiles that were later removed due to being considered overkill! A mighty roar that is very loud! We also suppose that it will make you very afraid! A hidden laser beam that kills your enemies AND damages the ozone layer! While we realize that everyone with good enough sense would be trilled to buy this little puppy and take it for a road trip USA we must warn you before your hearts shatter with the sad news. 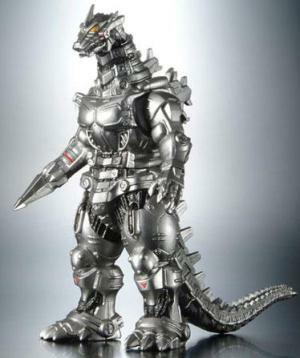 The RC Mecha Godzilla was released on a limited run and has already sold out on the land of the far east. While potential buyers crying over the fact that they won't be able to cruise route 66 on the shoulders of this mechanic fiend should not despair, however, since Bandai has dropped hints of a potential second run. Those interested should already set aside a good amount of cash to acquire this piece of earth shattering power. The RC Mecha Godzilla retails for almost $900 USD, a price we consider minimal for getting your hands on this piece of gear. Fly And Swim Almost at The Same Time? Great Idea? How Do You Contain A Material So Hot It Vaporizes Everything It Touches?